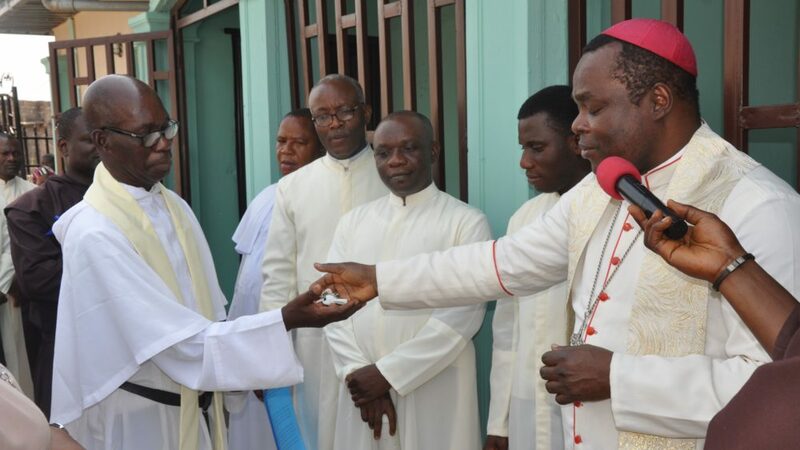 Friday, 4th January 2019 was a day of special significance for Catholics and non-catholic alike of Ihumudumu Community in Ekpoma. On that day, St Gabriel Catholic Church which till then was an out-station under Mary the Queen Parish, Eguare Ekpoma was made on Autonomous Mass Centre by the Chief Shepherd of Uromi Diocese, Most Rev. Donatus Ogun. 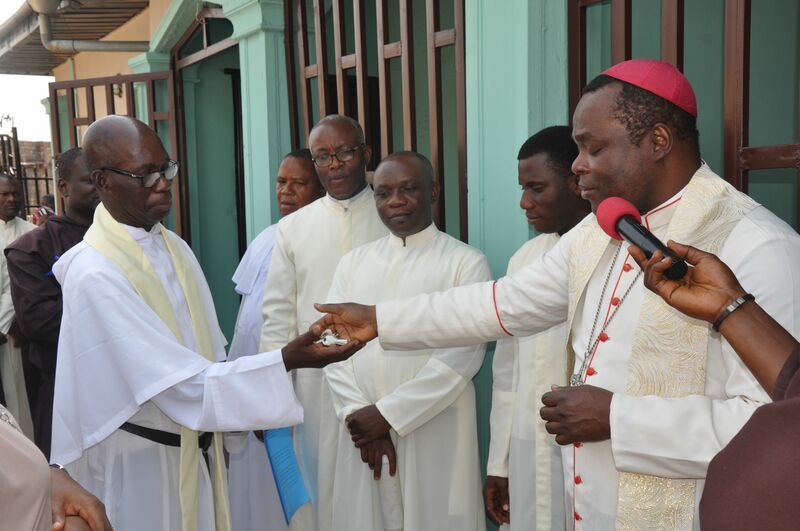 After the homily, the Bishop declared the Church of St. Gabriel, Ihumudumu autonomous. With this declaration, the Bishop handed the keys of the Church to the Order of Saint Augustine. In response, the representative of the Provincial Superior of the Augustinians, expressed their gratitude to God, his Lordship and the entire Diocese for giving them the Mass Centre to administer. He promised that the priests of the Order will discharge their work faithfully. The priest-in-charge was presented and introduced to the people. He is Rev. Fr. Anthony Edukore, OSA. The worshipping community of St. Gabriel Mass centre, through the laity president, Mr. Francis O. Ogedegbe, expressed gratitude to God for his benevolence towards them. His Lordship, the Bishop of Uromi Diocese was equally appreciated for making the Church an Independent Mass Centre. The laity president affirmed that the presence of a resident priest in their community, as one of the blessings of the autonomous Mass Centre, will touch and bring salvation to many souls. The parish priest Rev. Fr. Eliseus Umeakuana, OCD, his pastoral team, all the Carmelite priests that have worked in the Mass Centre were thanked for their wonderful work in nurturing the Church. Due gratitude was likewise extended to the faithful who have in one way on the other contributed to the growth and development of the Church. St. Gabriel Catholic Church was founded in 1955 by Rev. Fr. J.O. Mahon. Since 1996 when the Carmelite fathers came into to administer Mary the Queen parish, the Church has been administered by the Carmelite fathers. At the moment, the new Mass Centre has as a massive building under construction. The project was started by Rev. Fr. Evaristus Ekwem, OCD in 2009 while he was parish priest of Mary the Queen Parish. The new independent Mass Centre has been entrusted to the pastoral care of the Augustinian fathers with Rev. Fr. Anthony Edukore, O.S.A. as the first priest-in-charge.